Shenzhen Molihe Tech Co., Ltd.
richang * Factory direct. * Stock available welcome order. Material: Fresh Water Pearl Shape Provide: Round shape Color Provide: White,Pink,Purple Size Provide: 8-9mm Quality Provide: AAA Supply Ability 5000000pcs/month Payment: Paypal, T/T, Western Union, MoneyGram Shipment: DHL, FEDEX, TNT, UPS, EMS Sample: The stock sample is free, only the express charge is charged. Guangzhou Mingsi Stainless Steel Jewelry Co., Ltd.
if the sample need make new mould , it takes more time . please send me your clear sample picture or design picture, we wil check it by our designer . you can inspect by visiting our factory by person, or ask the third party for inspection . Yiwu Maida Crafts Co., Ltd.
Ningbo Yingmanzi Import & Export Co., Ltd.
2. Multi package: We can accept many kinds of package, such as opp bag ,gift box or customized package . 3. Accessories: Accessories for jewelry on our site can be sold separately . 4. OEM SERVICE: OEM service is acceptable, you can choose the design(material , color , size ) and package method. Guangzhou Wanxinghui Jewelry Co., Ltd.
Yiwu Yafei Ni Jewelry Co., Ltd.
Dongguan Happy Beauty Jewelry Co., Ltd.
Quzhou Dara Jewelry Co., Ltd.
Yiwu Saint Dragon Jewelry Co., Ltd.
Zhuji Fanti Pearl Co., Ltd. Sample time: Around 3-5 days after design and sample charge confirmed. Sample fee: It will be collected based on real cost of pearl and accessory. While, each pearl is not 100% same as others since peals are the organic jewel from nature. 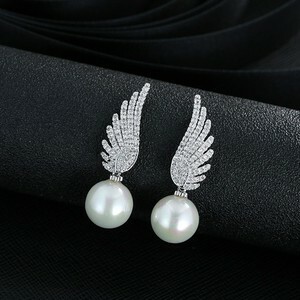 Alibaba.com offers 36,181 silver pearl earrings products. About 83% of these are earrings, 58% are silver jewelry, and 39% are pearl jewelry. A wide variety of silver pearl earrings options are available to you, such as anniversary, gift, and engagement. You can also choose from women's, unisex, and children's. As well as from silver, alloy, and pearl. And whether silver pearl earrings is zircon, crystal, rhinestone, or amethyst. There are 35,579 silver pearl earrings suppliers, mainly located in Asia. 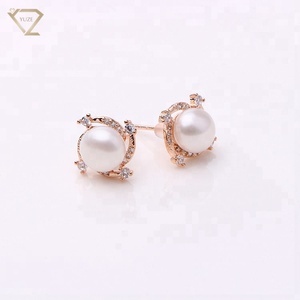 The top supplying countries are China (Mainland), India, and Thailand, which supply 78%, 19%, and 1% of silver pearl earrings respectively. Silver pearl earrings products are most popular in North America, Western Europe, and South America. You can ensure product safety by selecting from certified suppliers, including 2,838 with Other, 517 with ISO9001, and 283 with BSCI certification.